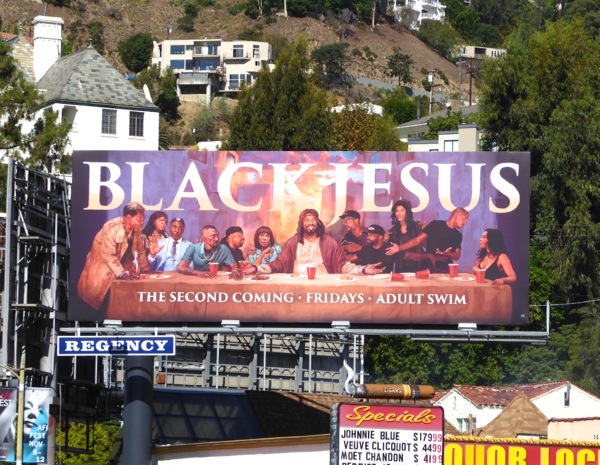 Black Jesus may have been back on our screens for a month now, but with the sheer onslaught of new TV shows these past few weeks it's taken this long to get around to acknowledging this fantastic billboard parody of Leonardo da Vinci's The Last Supper painting for the sophomore season of the live-action comedy. The late 15th century mural is one of the world's most famous paintings and it's not the first time it's been used to promote a TV show, movie or product, with everyone from Battlestar Galactica and The Expendables 2 utilizing the imagery in recent times. 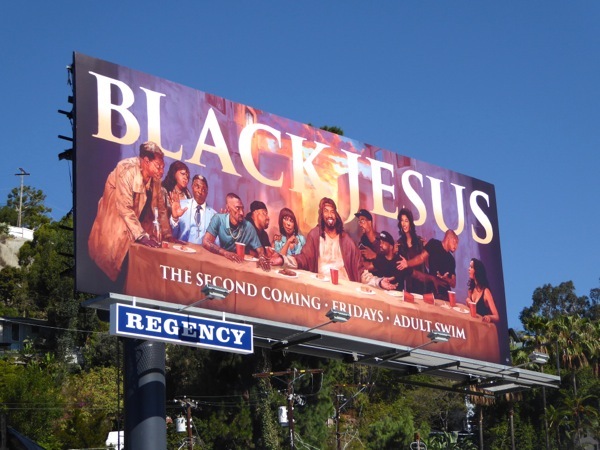 Now the infamous painting is being used by Compton's very own modern-day Jesus Christ and his band of followers. 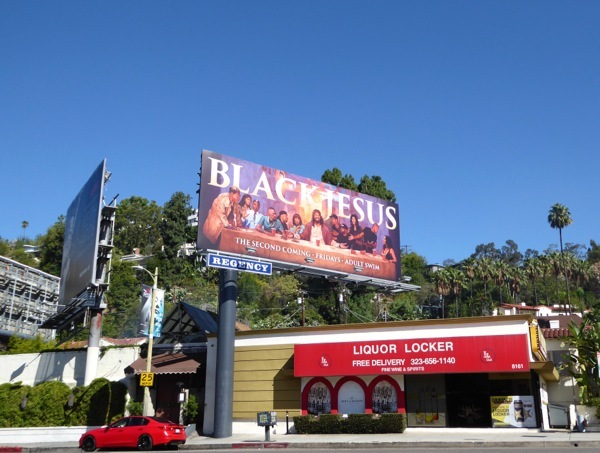 This spoof billboard was snapped along Sunset Boulevard in West Hollywood on September 17, 2015, and if you're a fan of the Adult Swim comedy series, be sure to also check out the Black Jesus season one billboard from last year. 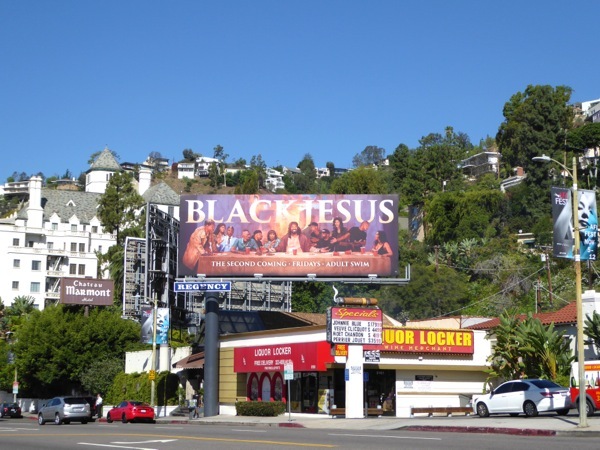 It's not the only painting to get the satirical treatment either, you just have to look at this Ricky Gervais Show billboard inspired Michelangelo's The Creation of Adam, or this American Gothic billboard parody for Fresh Off the Boat and this Summer's ad campaign for the Minions movie which saw their unique take on iconic works of art. 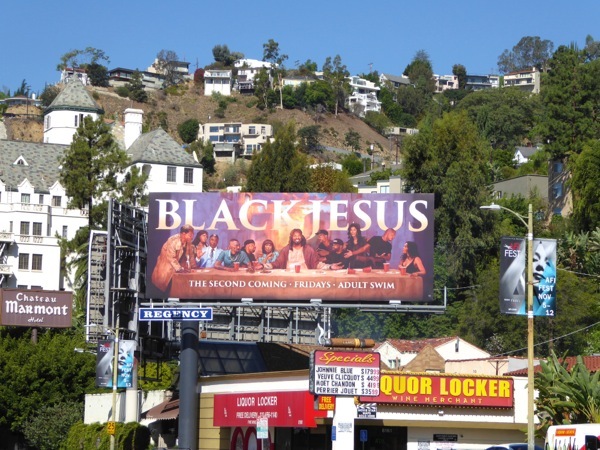 Praise the Lord for everyone's sense of humour and give thanks for all the artists and designers involved in these clever creations.